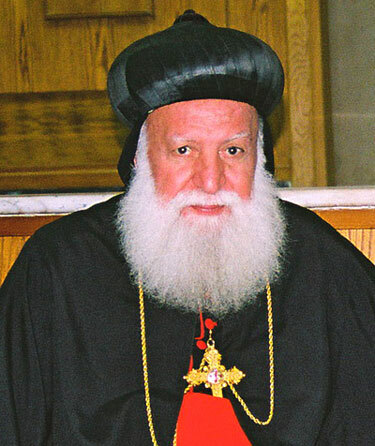 His Eminence Mor Athanasius Aphrem Barsaum, Archbishop of Beirut-Lebanon passed away to eternal life on 14 January 2016. Consecrated as Archbishop of Beirut on December 12, 1965, Mor Athanasius Aphrem Barsoum celebrated his golden Episcopal Jubilee after 50 years of service and devotion a few days before his demise. 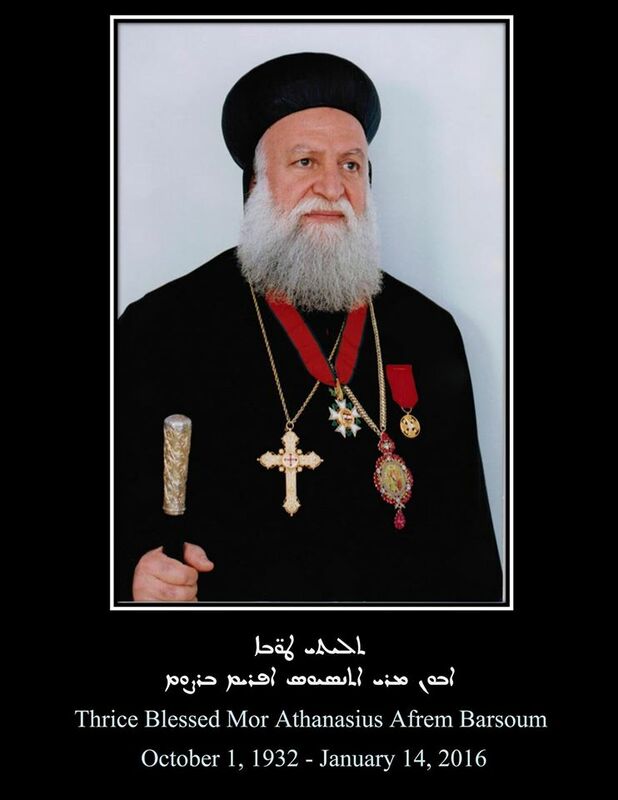 His Eminence Mor Athanasius Aphrem Barsoum was born on October 1st, 1932 in Homs, Syria. He studied in Qamishly till 1945 when he moved to the Seminary in Mosul. He graduated from there in 1952 and moved back to Homs to become the first secretary of Late Lamented Patriarch Mor Ignatius Aphrem I Barsoum from 1952 till 1957. He was then appointed as head of the Syriac School in Aleppo for 5 years (1957-1961). He was appointed the Patriarchal Delegate in India for 3 years (1961-1964) and a Patriarchal Vicar in Beirut for one year (October 1964- November 1965). His Eminence was ordained a Qoruyo in 1946 in Qamishly by Late Lamented Archbishop Mor Eustatheos Kuryakos Tannourji, and an Aphodiaqno in Homs in 1952 by Late Lamented Paulose of India (Later Maphriono of Malabar). He became a monk on April 11, 1954 by Late Lamented Patriarch Mor Ignatius Aphrem I Barsoum. On December 12, 1954, he was ordained as a deacon in Aleppo by Late Lamented Mor Dionysius Gergess Kass Behnam, and a priest by Late Lamented Patriarch Mor Ignatius Aphrem I Barsoum in Homs on March 4, 1956. On December 12, 1965, he was consecrated as the Archbishop of Lebanon by the Late Lamented Patriarch Mor Ignatius Yacoub III. He served in Lebanon for 43 years until he retired in 2008 as the Archbishop of Beirut. In Beirut, he served the church in good and bad times. He remained in his archdiocese despite the severe conditions and insecurity due to the war in Lebanon. He authored 16 books in Syriac and Arabic; he wrote many poems and songs that are widely spread in the Syriac world. Two books written by Mor Athanasius was later transalted & published in Malayalam, " Velli Nakshathram" & "Seemakkaraya Pithakkanmar". His Eminence also participated in numerous conferences and assemblies. He is one of the founders of the Middle East Council of Churches (MECC) where he represented the Syriac Orthodox Church for more than 25 years. 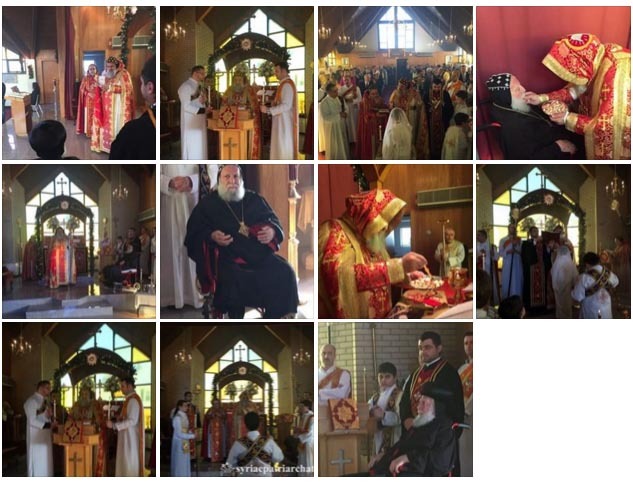 Mor Athanasius Aphrem Barsoum celebrated his golden Jubilee of his Episcopal ordination after 50 years of service and devotion on Sunday January 3, 2016, the day of Theophany (Denho). On that auspices occasion, His Holiness Mor Ignatius Aphrem II, Patriarch of Antioch & All the East, offered the Holy Qurobo at St. Ephraim Church in Rhode Island and honored His Eminence Mor Athanasius Aphrem Barsoum by decoration him with a pectoral icon. His Holiness spoke about the different stages of His Eminence's life, citing the different services and projects he administered as well as the different positions he served in since his early ordained life. His Eminence Mor Dionysius Jean Kawak, Patriarchal Assistant and Patriarchal Delegate in the Archdiocese of Eastern USA, assisted His Holiness during the Holy Qurobo. Barely 11 days after this he passed away at the age of 84. May the prayers of the Late Archbishop Mor Athanasius Aphrem Barsaum be with us and His memory be eternal, amen.